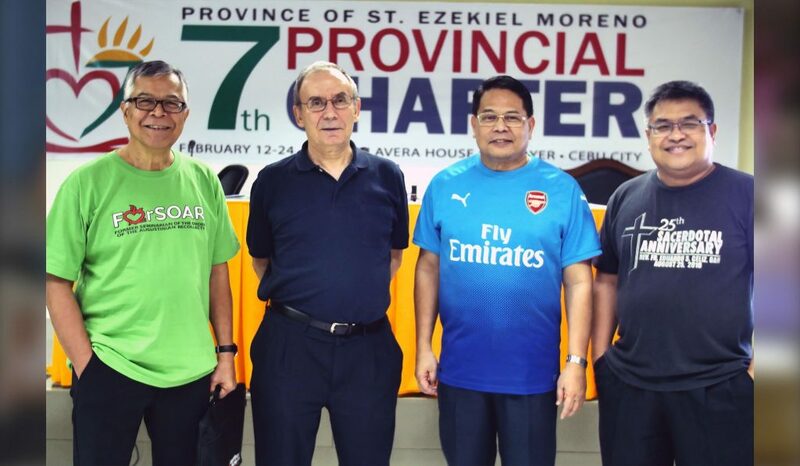 CEBU CITY – The shortlist for the 7th Prior Provincial of the Province of St. Ezekiel Moreno was finally announced by the Prior General, Fray Miguel Miró OAR, towards the end of the evening session today, February 20. The top three highest votes were garnered by Fray Dionisio Selma with 60 votes, followed by Fray Leander Barrot with 14 votes, and Fray Lauro Larlar, 9 votes. These three religious were also the ones who composed the “terna” in the previous provincial chapter, in 2015. Fray Selma is the 6th Prior Provincial. Fray Barrot is the Vice Prior of the community of Recoletos Formation Center (RFC) while Fray Larlar is the Local Prior of RFC. Moreover, the scrutiny for the recent election revealed an unprecedented statistics in the history of the Province as all of the 146 voting religious voted, registering a spine-chilling 100% participation rate of the friars who have the right to vote. Last year, during the election of the delegates to the 7th Provincial Chapter, the canvassing of votes reported a 97.24% turnout, also the highest in the history of this 20-year old Province. Anytime tomorrow, February 21, the election from among the ternary will take place. Whoever gets elected will be charged to steer the direction of this youngest province of the Order for the next quadriennium (2018-2022).